Oxid Med Cell Longev, 2017, 2017:1035702. Sirtinol purchased from Selleck. PC12 cells were treated with Sirtinol (50 μm for 24 h) and immunoblotted with the indicated antibodies. Sci Rep, 2016, 6:21857. Sirtinol purchased from Selleck. HG and PA decreases SIRT1 expression and the effects of resveratrol and sirtinol on the expression of SIRT1. (A) The mRNA expression of SIRT1 analyzed by real-time PCR. (B) The protein level of SIRT1 assayed by western blotting. RSV: resveratrol. N = 3, data are presented as mean ± SD, ∗P < 0.05 vs. control group, #P < 0.05 vs. HG + PA group. Mol Cell Endocrinol, 2018, 474:97-104. Sirtinol purchased from Selleck. SIRT1 inhibitor exacerbates TBI-induced mitochondrial damage, promotes neuronal apoptosis and activates p38 MAPK signaling. Rats were injected intraperitoneally with the SIRT1 inhibitor sirtinol (10 mg/kg) 30 min before LFP-induced TBI. After 12 h, rats were sacrificed. (A) The expression of SIRT1 and β-actin were detected by Western blot. β-Actin was used as loading control. (B) Quantification of Western blots for SIRT1. (C) The expression of SIRT1 was analyzed by immunohistochemical staining post-TBI. Acta Pharmacol Sin, 2017, 38(2):168-181.. Sirtinol purchased from Selleck. Effects of sirtinol on SIRT1 expression and HIF-1α. hMSCs were treated with sirtinol (100 uM) or equivalent concentration of DMSO (CTR) for 24 h and then exposed to 1% O2 for 6 h. All cells lysates were analyzed for SIRT1, HIF-1α, and tubulin by Western blot. Biomed Res Int 2014 783459. Sirtinol purchased from Selleck. SIRT1 is involved in GABA-mediated protection against apoptosis and induction of insulin secretion. 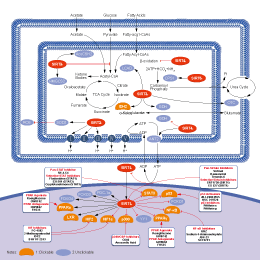 INS-1 cells are protected from apoptosis induced by tacrolimus (FK506; panel A) or streptozotocin (STZ, panel B) by GABA, and the protective effect is reversed by EX527 (SIRT1 inhibitor) or sirtinol (SIRT1 and SIRT2 inhibitor). The cells were incubated with GABA (100 uM), EX527 (200 nM) or sirtinol (4 uM) as indicated, for 1 h before adding 1 uM FK506, and cell viability was tested after 48 h. Similarly, STZ (2 mM) was added after the cells were incubated with other reagents for 1 h, but was replaced with the original medium containing all additives and no STZ after 1 h incubation. Viable cells were counted after 24 h. The results are representative of two experiments. Biochem Biophys Res Commun 2014 452(3), 649-54. Sirtinol purchased from Selleck. Sirtinol does not inhibit class I and class II HDACs. 1.5 μg of recombinant human GST-Sirt2 (amino acids 18-340) are incubated at 30°C for 2 hours in 50 μL of assay buffer (50 mM Tris-HCl, pH 8.8, 4 mM MgCl2, 0.2 mM dithiothreitol with different concentrations of Sirtinol, 50 μM NAD, and tritiated acetylated HeLa histones (1000 cpm), purified by acid extraction. HDAC activity is determined by scintillation counting of the ethyl acetate-soluble [3H]acetic acid. Cells are grown to 60% confluence and then treated with 30 μM or 120 μM sirtinol for 24 or 48 hours. Cells are trypsinized and collected. The cells are pelleted by centrifugation and resuspended in PBS (120 μL). Trypan blue (0.4% in PBS; 10 μL) is added to a smaller aliquot (10 μL) of cell suspension, and the number of cells (viable unstained and nonviable blue) are counted. Grozinger CM, et al. J Biol Chem, 2001, 276(42), 38837-38843. Mai A, et al. J Med Chem, 2005, 48(24), 7789-7795. Ota H, et al. Oncogene, 2006, 25(2), 176-185. Liu FC, et al. Acta Anaesthesiol Scand, 2008, 52(5), 635-640. Kojima K, et al. Biochem Biophys Res Commun, 2008, 373(3), 423-428. Cao C, et al. J Cell Mol Med, 2009, 13(9B), 3632-3643. Jung-Hynes B, et al. J Biol Chem, 2009, 284(6), 3823-3832. Sun JY, et al. Clin Lymphoma Myeloma Leuk, 2011, 11(1), 152-156.